Cairo • Egypt&apos;s President Abdel-Fattah el-Sissi told The Associated Press on Saturday he is prepared to give whatever support is needed in the fight against the Islamic State group but called for a "comprehensive strategy" to tackle the roots of extremism across the region. 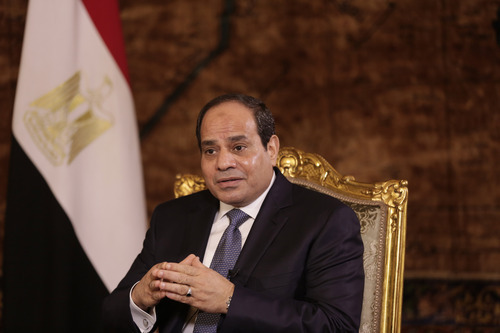 In his first interview with a foreign media outlet since taking office in June, el-Sissi sought to present himself and Egypt as being at the vanguard of confronting militancy, citing it as the reason for his ouster of Egypt&apos;s first freely elected president more than a year ago  a move that brought international criticism and strained ties with top ally the United States. He told AP that Egyptians had realized the danger of "political Islam" and that if he had not acted, the Arab world&apos;s most populous nation would have faced "civil war" and bloodshed now seen in Iraq and Syria. "I warned about the great danger a year ago," he said. "But it was not clear (to others) until the events in Iraq and the Islamic State&apos;s sweep" over much of that country. El-Sissi did not elaborate on what support Egypt might give to the U.S.-led coalition aimed at fighting the extremist group. When asked if Egypt might provide airspace access or logistical support for airstrikes, he said, "We are completely committed to giving support. We will do whatever is required." But he appeared to rule out sending troops, saying Iraq&apos;s military is strong enough to fight the militants and "it&apos;s not a matter of ground troops from abroad." Speaking in a chamber in his Ittihadiya presidential palace, he said it was "very important" to stop foreign extremists from joining militant groups in Syria and Iraq, warning that they will return to their home nations, including in Europe. But he said a broader strategy is needed that also addresses poverty and improves education in the region. In his previous post as head of the military, el-Sissi ousted President Mohammed Morsi in July 2013 and launched a heavy crackdown on his Muslim Brotherhood movement. Since then, more than 1,000 have been killed and more than 20,000 imprisoned as police have crushed protests and rounded up Brotherhood leaders. 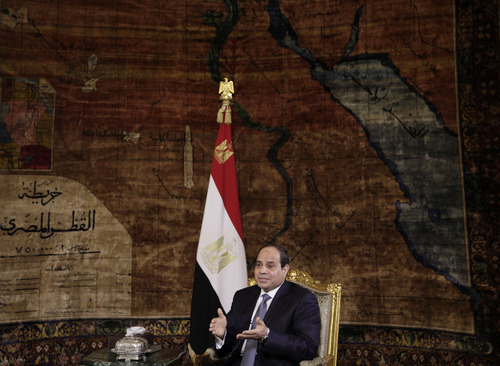 El-Sissi said the Brotherhood "had a chance to rule Egypt" but that Egyptians turned against it  referring to the massive demonstrations in the summer of 2013 demanding Morsi&apos;s ouster. Justifying the crackdown, he said the Brotherhood had "chosen confrontation." But he said followers of the group, which has been banned, could participate in politics in in the future if they renounce violence. "If I had been in charge at the time, I never would have let the issue go so far. I would have deported them," he said of the three. But he said that if Egypt is to have an independent judiciary, "We can&apos;t accept criticism or comment" on court rulings. The three journalists  Australian Peter Greste, Canadian-Egyptian Mohamed Fahmy and Egyptian Baher Mohammed  were convicted of promoting or belonging to the Brotherhood and of falsifying their coverage of protests by Morsi&apos;s supporters to hurt Egypt&apos;s security and make it appear the country is sliding into civil war. But the three said they were arrested for simply doing their job reporting, and during the trial prosecutors presented no evidence any footage was falsified, simply presenting the news reports of protests as evidence.